Lokopriya Gopinath Bordoloi Regional Institute of Mental Health (LGBRIMH), Tezpur, is undergoing up-gradation. A 336 bedded new hospital building with all the facilities for treatment of psychiatric disorders is almost complete and will be ready to serve the entire northeast region of the country. Besides, a new academic building, cafeteria, residential quarters and hostels have already been completed. Keeping with the pace of information technology and in line with the promotion of Digital India Initiative, a new modern Central Library and Informatics Center will also be open at LGBRIMH. 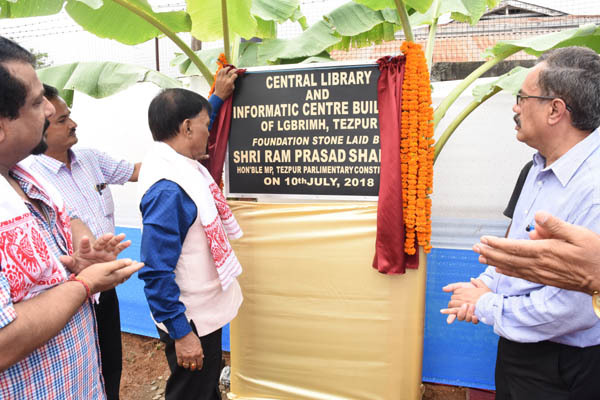 The foundation stone for the centre was laid by RP Sharma, Member of Parliament, Tezpur Lok Sabha her, said that after submitting a memorandum to the Prime Minister and Union Health Minister during last Parliamentary session and the project have been sanctioned by the Union government . Sharma highlighted in his speech the importance of mental health and the need for a specialized centre in the region. He described the beauty of nature and its role in mental and psychological health. He spoke about how humankind has distanced himself from nature and has invited a multitude of physical and mental illness for himself. On the occasion additional Deputy Commissioner, Sonitpur, Kulen Sharma graced the occasion along with other dignitaries from various institutions. Sharma praised the efforts of the institute to grow into a centre of excellence. Projected to be one of its kind in the NE region, the centre will have facilities like tele-conferencing, telemedicine and telecommunication. The estimated cost of the project is around 23.43 crores and would be completed within a period of 2 years from the date of commencement. A 100 bedded neurology and neurosurgery block, sports and recreational facility will also be coming up in LGBRIMH in phases for the all-round development of the institute.